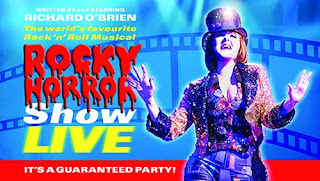 Last Friday night Stuart and I went to see The Rocky Horror Show at the Playhouse Theatre in London's glitzy West End. Revived for a couple of weeks preceding a national tour the Narrator was played by none other than Richard O'Brian himself. Great singing, funny acting, clever sets, lots of shouting out by the audience, and the cast mugging to the largely dressed-up crowd - we had a blast. We laughed, sang and danced. What a great show it is - everyone feels they own that show.